If you’ve been cleaning grout recently and noticed that your grout — the material holding your floor or shower tiles in place — is crumbling or cracking, you’re probably wondering why. At The Grout Medic, we specialize in grout care, cleaning and replacement, and over the years we have seen many different causes of cracking grout. 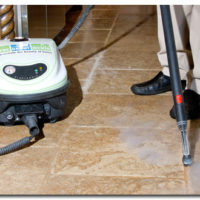 If you need tile regrouting services, call the experts at The Grout Medic. We can correct the problems with your grout and ensure your bathroom, kitchen or tiled surface will continue looking great for years to come. Just about all grout will need to be repaired or replaced at some point. But there are a few reasons why some grout breaks down more quickly. Grout is a type of lightweight concrete used to fill in the gaps between tiles. It allows the tiles to stay in place and prevents water and dirt from getting underneath tiles. Newer grout is manufactured with polymers to help prevent cracking. However, older grout was made from sandy cement that is prone to cracking over time. If you live in an older home, it’s likely this older form of grout was used, making it more susceptible to damage. Though some grout is premixed, other forms come in a powder that is mixed with water before it’s applied to the joints between tiles. Unskilled or uninformed installers may add too much or not enough water; they may under-mix the compound, leaving lumps; or they might not use the right tools or apply enough grout in the grooves. Mistakes in grout mixing such as these can result in cracked or crumbling grout. Properly mixed and installed grout will remain viable for years. However, it is a porous substance that eventually breaks down.. Over time, water, dirt, mold and mildew make their way into the microscopic holes, causing the grout to chip, crack and crumble out of the tile. Many people unknowingly damage their grout while trying to care for it. Using bleach, vinegar or other chemicals in an attempt to clean the grout, they end up doing more harm than good. Caustic chemicals disrupt the bond in the grout’s components and over time cause it degrade and wear away. Don’t try cleaning grout yourself; count on The Grout Medic to do it for you! The Grout Medic specializes in water damage repair, repairing or replacing grout and tile to get a room back to looking beautiful. Events such as a flood, earthquake or plumbing disaster are much more obvious causes of grout damage. Large amounts of water sitting on the floor for a lengthy amount of time presents a great threat to grout, as the moisture seeping into it will quickly degrade it. An earthquake can cause your subfloor to shift, cracking grout in one violent push or creating small cracks that soon turn into crumbling situations. Whatever has caused your grout to crack and crumble, it’s best to address the problem now before it gets worse. What starts as a hairline fracture can absorb water and dirt and become an even bigger crack and a more serious repair. Find your local office of The Grout Medic to get a free estimate on tile regrouting and water damage repair services or give us a call at 1-866-994-7688 today!